NASA could have humans back on the moon within the next five years under the latest orders from the Trump administration. 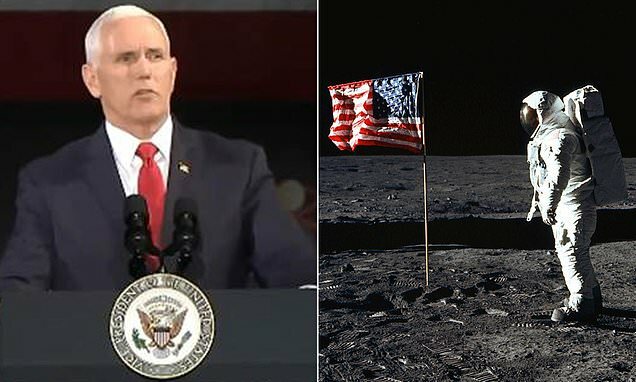 Vice President Mike Pence revealed the new deadline during a speech at the fifth meeting of the National Space Council in Huntsville, Alabama today, where he told an audience that the president wants astronauts to touch down on the lunar south pole by 2024. The VP called on NASA to ‘reignite the spark of urgency’ for space exploration and make it a priority to set ‘bold goals’ and stay on schedule. NASA’s plans to send humans to the moon rely on its upcoming Space Launch System (SLS) rocket and the Orion crew capsule. But, SLS has faced numerous delays over the years, and the agency just recently revealed it will not be ready for the uncrewed Exploration Mission-1, which will serve as crucial proving ground for subsequent missions with crew on board. Despite the mounting obstacles, the Trump administration says it's eyeing a much sooner deadline than NASA had previously planned for. 'Since the end of Apollo 11, we’ve forged incredible breakthroughs in our technology that have allowed us to go further, more safely in space than ever before,' the Vice President said on Tuesday. 'Just as the United States was the first nation to reach the moon in the 20th century, so too will we be the first nation to return astronauts to the moon in the 21st century,' Pence said.